U.S. official: Trump and Putin agreed at summit that Iran should exit Syria, but Russia believes it will be difficult to accomplish. U.S. President Donald Trump and Russian President Vladimir Putin agreed in principle during their July summit in Helsinki that Iran should exit Syria, a U.S. administration official familiar with the meeting said Thursday, according to Bloomberg news. The summit was largely dominated by discussion of the crisis in Syria and Iran’s role in the conflict, said the official, who spoke on condition of anonymity. Russian leadership, however, said accomplishing Iran’s withdrawal would be difficult. Trump and Putin also discussed the campaign against the Islamic State, disputes over Golan Heights, and the humanitarian situation in Syria, which has suffered years of civil war, the official said. Trump briefed his chief of staff, John Kelly, National Security Adviser John Bolton, Secretary of State Mike Pompeo and U.S. Ambassador to Russia Jon Huntsman for 15 minutes immediately after meeting one-on-one with Putin, the official added. Iran’s presence in Syria has been a major cause for concern for Israel. Israeli officials have made clear that Israel will not accept any Iranian military entrenchment in Syria. Prime Minister Binyamin Netanyahu and Putin have held several meetings to discuss the issue. Both Tehran and Moscow are backing Syrian President Bashar Al-Assad in the Syrian civil war. Near the start of the Syrian civil war, it was reported that then-Iranian President Mahmoud Ahmadinejad had personally sanctioned the dispatch of officers from the Iranian Revolutionary Guards to Syria to fight alongside Assad’s troops. Late last year it was reported that Syrian army forces, backed by Iranian-backed militias, were pushing deeper into the last rebel-held enclave near a strategic border area with Israel. 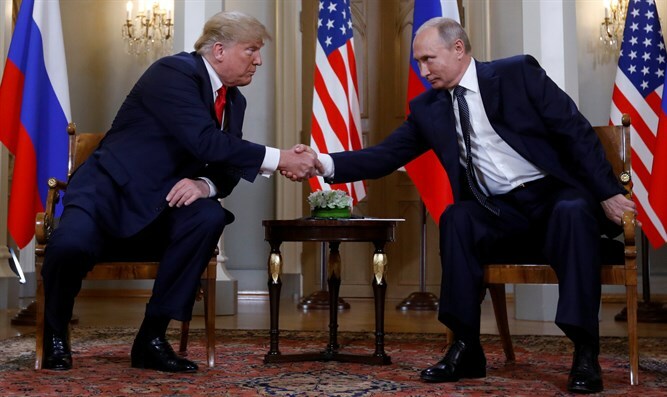 According to the Bloomberg report on Thursday, the Putin-Trump meeting in Helsinki garnered little in terms of concrete agreement, and the two sides did not approve the extension of a pair of arms control treaties during the talks. During his closed-door meeting with Putin, the U.S. president told his Russian counterpart that he expected meddling to stop in the 2018 election, according to the official. The topic was the first raised by Trump during their bilateral conversation, the official said. Trump came under fire after the meeting after he appeared to back Putin’s claims regarding Russia’s meddling in the 2016 presidential election.